Websites help you to get your message across. Think of them as an advert for your business, and a reference point for anyone interested in your services. The key thing to remember though, is to target your website to the audience. A website is tool to help them get to you. You may want lots of flashy stuff with spinning logos and music , but is that what your customers really want to see? We try to keep our websites as simple as possible to help you get your message across. Visitors to a website will make their conclusions within seconds of seeing your homepage, so you need to keep them there, without distractions. 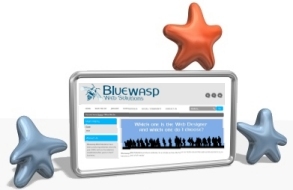 Bluewasp Web Solutions have a simple range of set packages, with set prices. Decide which one meets your needs, and that is the price you pay. If you don't need a website yet, or are just not ready to fully take the plunge, we offer an online business card. It shows your logo and contact details and sits under your own .co.uk web address. It also stops anyone else grabbing your name. Just £20 pa.
A low cost, Starter option, typically consisting of 5 pages. This could include a welcome page, a description of your product, a contact page and so on. Ideal if your content will not change very often. As above but includes a Content Management System - you make the changes and can add new items of news, events, blog, forum, gallery. You can update the site as often or little as you like. It includes a user manual and a brief session on how to update the site yourself. This package is also ideal if you want to control your Search Engine Optimisation (SEO) yourself. This package can also be used to host a basic web shop, with a limited amount of products using Paypal checkout. This package is for those of you wanting to sell your products online or duplicate an existing street based shop. It includes the install of an online shop & we will upload of up to 10 items/products (more if you have the data electronically otherwise you can upload the rest), Training on how to use the shop and update products, shipping etc. If don't think your requirements fit within the standard models, we can still help you. Just let us know what you want for a free estimate. So how much does it cost??? Contact us for further details as these prices change often. But as a guide the ADVANCED package is currently £449. If you already have a website, but want it redesigned, again choose which category your site best fits into and that will be the price. We also offer monthly maintenance options for new and existing websites, starting at just £20 pcm. Websites can become quickly out of date so this option ensures all your latest news and product information get published to your site. Keeping your site dynamic encourages vistitors to return.